"Rolo is his Dad's baby. 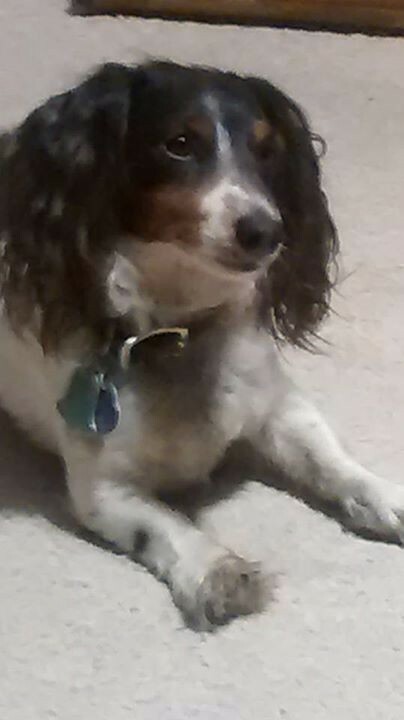 He is a miniature piebald long-haired Dachshund and is such an amazing companion. Today a PIT BULL, strange to the neighborhood came into our yard and attacked our little guy. He was violently shaken and bitten-completely around his shoulders and chest. His diaphragm is broken and five ribs on his upper chest left side, with multiple punctures. It's hours later and he is holding his own under critical care at midwest veterinary hospital, under Dr. Porters care. In the morning he will be reevaluated in the morning for surgery to repair his diaphragm and ribs. His grandpa (dad) has never asked for anything in his life and works hard at Elkhorn Fence company his whole adult life and makes decent money but this is huge. Already into two thousand dollars paid, but Rolo is worth it as our little buddy and even his rare piebald coloring and breed. We love him so much and will sell a kidney if he needs the surgery. Please. 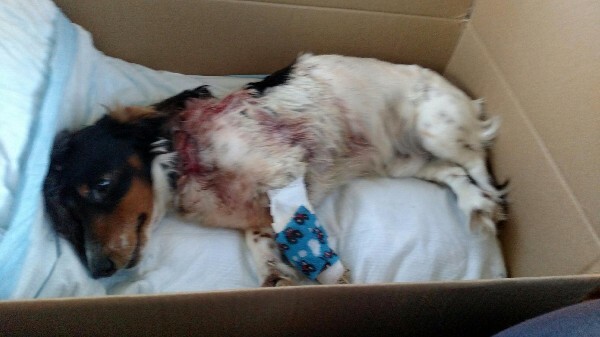 If your a pet parent, an animal lover, Dachshund lover, I ask for your prayers. Your donation would be helpful but if you can't or decide not to please just pray. Rolo was in his yard at home-he did nothing wrong. Please pray for all of us to be comforted. If you are concerned where money exactly would go, you don't even have to donate to us... The vet clinic information is VCA Midwest Veterinary Specialists of Omaha 9706 mockingbird drive Omaha, NE 68127 402-614-9000 fax 402-6145445 VCAmidwestvetspecialists.com owner name is Kenneth R Brooks. I am his girlfriend of a few years...Rolo calls us Grampa...and Gramma. I pried him from the other dogs mouth...I would do anything for this little guy."